Make writing fun with this dinosaur writing prompt, perfect for kids who are fascinated by the prehistoric world. Practise writing sentences by answering this question and more about school in this creative writing worksheet. Kids practise narrative writing with this personal prompt. Answer this question and many more in this creative writing worksheet in which first graders can practise writing sentences. Answer this question and more with this writing exercise that allows you to practise sentence writing. Answer this question and more in this creative writing worksheet that allows you to practise sentence writing. Practise writing sentences by answering this question and more about music in this creative writing worksheet. Your students have been working hard on their narrative writing skills! Use this writing assessment to evaluate their abilities to develop and describe characters in their narrative writing texts. Students will review their own writing and a partner's writing, checking for correct punctuation, capitalization, complete sentences, and staying on topic. After writing a draft of an informational piece, have students edit their writing with this handy checklist. After writing a draft of an informational piece, have students revise their writing with this handy checklist. Keep track of their writing goals. Refer to the goals during writing workshop conferences, and be sure to have students add to them and revise them as needed. Use this writing prompt activity to assess your first graders’ abilities to write informational texts. Students will use details and facts to convey a topic of their choosing. Use this writing prompt activity to assess your students’ abilities to develop a setting when writing narrative texts. Get started with writing and explaining great opinions with these words. Practise writing sentences by filling in the blanks to answer questions about home. Answer this question and more in this exercise that allows you to practise sentence writing. Use this opinion writing worksheet to give your 1st grader some practise writing reasons to back up her opinions about fruit. Get into the Halloween spirit with this creative writing activity! Answer questions about how you celebrate by filling in the blanks to complete the sentences. 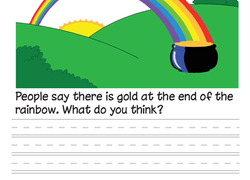 Give your child practise with his writing skills with this printable writing worksheet that prompts your child to write about rainbows. The jungle has long been a favorite setting for writers, and your budding author can set the scene (and illustrate it too) with this jungle writing prompt. After writing a draft of an informational piece, this activity gets students working in pairs to improve their writing.